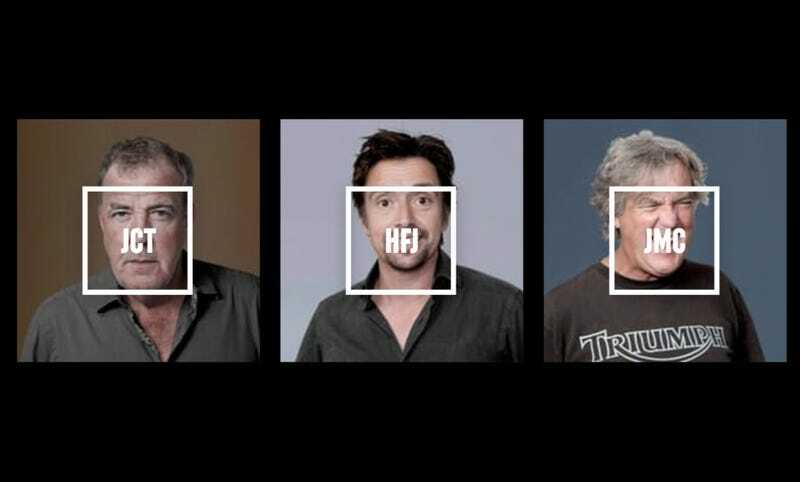 By now you’re well aware that your favorite former Top Gear stars Jeremy Clarkson, James May and Richard Hammond are making car vids again on The Grand Tour. They’re also starting a new social network for car people called DriveTribe. Let’s crash through the front door together. Today Clarkson released this little teaser video to get us associating the term “DriveTribe” with slow-motion drifting and tire screeching. Looks like the site/network/pages will be completely online one week from today, on November 28th. After some back-and-forth with Clarkson and co’s publicists I finally figured out it made the most sense to just log in, rageclick around a little and report my findings. Simply put DriveTribe is a social media platform, but everything on it connects to cars. It’s more like a forum than a profile page. That is to say– the focus is on quick-hit conversations rather than housing everybody’s spec sheets and glory photos of their own cars. Think “Tumblr/Instagram” rather than “CarDomain.” I know you remember at least one of those. Drivetribe.com greets you with a caraction.gif and a single option: “Sign in with Facebook.” Clicking there now will ask you for an invitation code or make you to apply for one. I did that a few weeks ago, and today a code appeared in my inbox. I’m under the impression that by November 28th this stipulation will be lifted. What do I find when I finally do get in? You basically land on a homepage that looks like Instagram on desktop or Tumblr (anybody still on Tumblr?) with your Facebook profile picture pre-uploaded for you. No details though, those you get to add yourself. You get a little space for a “bio” and a line for a website, a la Twitter. But first you need to join some Tribes. DriveTribe will force you to join six to get going, but it seems as though you can join as many as you want. Some have a stricter theme than others. A few, at least the ones lead by Clarkson, May and Hammond, appear to have a “verified” check so you know you’re not messing with an imposter. Though impersonation is strictly against the site’s terms and conditions, which we’ll get more into later. For now, just click on all the ones that look pretty. Like most online relationships, there’s very little commitment expected or required here. I joined a tribe, now what? So let’s check out James May’s “Carbolics” tribe. (Not “Carbaholics” as I read it the first ten times.) The only descriptor we get is “Guaranteed free from helmsmanship.” Sure, why not. So far I reckon the site is big on brevity with a healthy dash of whimsy. What can you do here? Well, you can look at pictures and witty comments May has posted, comment on them and “bump” them (we call “likes” “bumps” on DriveTribe.) Presumably a “bump” pushes whatever you’ve “bumped” to the top of a given Tribe’s page when enough get racked up. You can also share this tribe elsewhere around the internet via Facebook and Twitter, but anyone who clicks the link will need to be a member of DriveTribe already for them to participate. But how do I post stuff? Some of the Tribes are open, meaning anybody who’s a member can post, and some like May’s are restricted to leaders. But anyone else can still comment. In the Dogs In Cars Tribe, for example, you can just jump in and post whatever you want by clicking that red “+” in the lower-right corner. Subject of course to Tribe leader moderation and DriveTribe’s T&Cs, which we’re getting to soon. In this respect DriveTribe is actually a bit like our Kinja platform here on Jalopnik. Only verified individuals such as myself can post directly to Jalopnik.com, but anyone can comment. Also, anyone can make their own blog and post whatever they want in their own little corner of the internet. So how do I start my own Tribe? Go to your profile, which you’ll recognize as your Facebook profile picture in the corner, and hit “create a tribe” below your big goofy face bubble. That will bring up a super streamlined side menu to make a Tribe name, quick description, add a leading image and decide if you’re going to be the only one posting or let the masses run wild in your Tribe. Pro tip: DriveTribe will turn your Tribe name into a three-letter acronym, christen yours accordingly. I decided to exploit my favorite niche and appeal to the exploding rusty truck enthusiast fanbase. Not sure what’s up with the underscore after everything. That wouldn’t be my aesthetic choice. When do the clicks start rolling in? So your first task is to get some #content on your Tribe’s page. DriveTribe only wants original pictures, thoughts and videos (no stealing other people’s work.) Get off Wikipedia Creative Commons and get outside with your camera! Once your Tribe site has a little dressing on it you can blast it out via Facebook, Twitter and wherever else with a share link but I don’t think anyone’s going to be able to join you until they have a login on DriveTribe themselves. What kind of stuff should I upload? Whatever you want? If you build your tribe around a theme like I did, I guess, stick to that. Your first upload is pretty approachable, the site gives you a photo/video uploader tool, lets you say a few words, and let it rip. Once you’ve got one thing uploaded you “unlock The Studio.” The Studio gives you a slightly more advanced post-uploading screen and builds you a different template depending on whether you want to share a video or a photo or an unhinged manifesto about brown diesel rear-drive wagons. You can basically shift between a broad “article”-style post, an Instagram-style “image” post, YouTube-style “video” or a little gallery. Here’s what the “article” editor tool looks like, for example. And you can jump in on any Tribe you’re a member of that allows members to post, or start your own. I needed another rusty old truck in a pinch so I napped one of my coworker David Tracy’s photos with his permission and tweaked it. DriveTribe’s editing screen lets you see previews of your post on phones or a computer, which is a neat touch. Otherwise this is all pretty self-explanatory, right? So what happens to my pictures and videos once I upload them? I originally interpreted DriveTribe’s terms to mean that the site had free reign over any content uploaded, but one of the site’s representatives reached out to clarify where I went wrong– DriveTribe can use your uploaded content in its own marketing at its discretion and does not have to credit you, but DriveTribe will not sell your work to a third party. The T&Cs mention a “revenue sharing” platform may exist in the future though, which could mean DriveTribe might actually help you make money with what you upload. Another line to be aware of is that while you can delete/remove your videos, photos and thoughts from DriveTribe at any time it may still exist in DriveTribe’s marketing if it’s already been put to work. Ok, I’m fine with that. How do I optimize my Tribe page for maximum awesomeness? If you’re making your own Tribe I have a feeling the more specific your theme is the more success you’ll have, since you’re automatically directly competing with the three best-known personalities in automotive journalism if you try to go generalist. I’m not giving you any more free internet business tips but as far as DriveTribe specifically, I’ve already noticed that it commits a web design sin most loathsome you’re going to have to work around: picture display ratios are not fixed. To break it down in plainer speak– the same image you upload will be square in some contexts and a rectangular in others. That makes it extremely annoying to optimize how you crop your images and it drives me absolutely nuts. Case in point– when you’re looking at a big list of Tribes, their respective icons are square (about 145x145 on my computer.) But if you click on one, that same image is suddenly a rectangle (about 578x405 from where I’m sitting) on a given Tribe’s landing page. Seems to be the same thing on your Tribe page’s feed. You can upload any image you want, but it shows up as a square until you click in to a certain post. So the whole thing is like Facebook Groups meets Tumblr meets Instagram, but for cars? But it’s not like CarDomain or WheelWell? No, DriveTribe seems heavily conversation-oriented as opposed to profile oriented. In fact there’s not really any provision for sharing specifics about your own car anywhere besides a regular post. In an attempt to keep you moving around the site, it seems as though features are “unlocked” the more you do. After stumbling my way around for twenty minutes or so I achieved “Scout level 1.” Further research is required to figure what the hell that’s all about, besides just motivating you to stay on DriveTribe. When can I try it again? You can try to log in now and see if the site will send you an invitation code, but it seems that the floodgates will open November 28th at which point I hope you click in and join the Rusty Old Trucks Tribe to share pictures of your favorite crapcans with me. Can I shamelessly lure people into my Tribe by putting a link in the comments here? I’d expect nothing less! Shout yourself out and give us a sentence about what your Tribe’s theme is if you want to get a gold star. Correction: I originally interpreted DriveTribe’s Terms & Conditions to mean that it maintained free reign over uploaded content including the right to sell it. However that is inaccurate, DriveTribe does not sell user-uploaded content it only uses such content in its own marketing. Additionally, you can in fact delete anything you upload, however DriveTribe may still use it in marketing. This is detailed in the amended section above.